Do you use your 4x4 in dusty conditions or to wade through deep water? May be you want to gain a few extra hp from running the air intake in cooler air away from the engine bay? A snorkel will help protect you engine from dust and water ingress and help it breath easier. Over the years we've come to trust one brand, Safari. For custom applications we can fabricate our own from TIG welded aluminium under the Rokraider brand. "From the Amazon to the Andies - from the Kalahari to the Kimberley - from the Sahara to the Simpson, four wheel drivers the world over have put their trust in a genuine Safari Snorkel System. Safari Snorkel Systems are manufactured to the highest standards in durable, UV stable, cross linked polyethylene material and deliver a continuous and cooler supply of air for maximum engine performance. Each system includes quality fixtures and fittings that deliver superior sealing, OEM levels of presentation and long-term durability." "At Surrey Off-Road we don't limit our selves to off the shelf parts. When we can do better through custom fabricating product, or when nothing else is available, we will! That's what the Rokraider brand is all about." 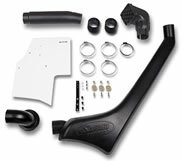 An example of our snorkel product (Jeep Wrangler TJ) is shown on this page. Please contact us to discuss your snorkel requirements. Applications: We can custom build snorkels for any application. PLEASE NOTE: These systems have to be built to order and are generally not available straight off the shelf. 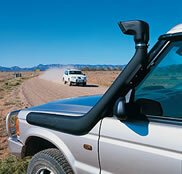 Safari make snorkels for most makes and models of 4x4. 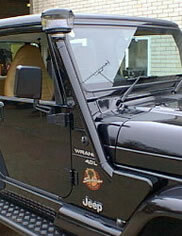 Rokraider Jeep Wrangler TJ Snorkel.